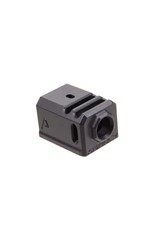 The Agency Arms 417 Compensator is threaded with the standard 1/2x28 thread pitch. It features a 2 chamber design (2 vertical ports and 2 side venting ports. It is designed to utilize the OEM recoil spring assembly and it also features a front sight hole, allowing you to transfer your existing front sight from your slide to the comp. Compatible with the 17,19 and 34.